Neck pain or Neck stiffness can tremendously affect everyday life with anxiety, tension, and pressure. The neck is made up of tendons, muscles, cartilages and seven small bones, thus, it needs proper care. Several factors are considered to enjoy pain-free and relaxed sleeping experience. Usually physicians have found that sleeping component like a wrong pillow is one of the most prominent reasons for neck pain. In the market, there are a large number of pillows for neck pain, all with different features & functions. Thus, finding the best among them is a complex task and various factors should be considered before buying a pillow. Whether you are a back, side or stomach sleeper, it’s very important to understand the most suitable pillow that suits your sleep habits. • Side Sleepers: If you are a side sleeper, a higher pillow like Sleepsia contour memory foam pillow is best for you. This type of pillow has a contour shape that properly fits the complex structure of the neck and shoulder by maintaining a proper spine alignment. 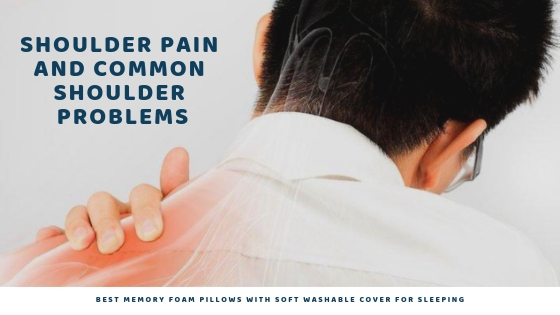 • Back Sleepers: If you have a habit of sleeping on your back, a pillow that is low offers elevated support for the neck, like the Memory foam pillows with infused gel is the best. • Stomach Sleepers: If you are a stomach sleeper, the flat pillow is the right choice, like the Bamboo Memory Foam Pillow because it’s adjustable and eco-friendly by reducing the strain. • Memory Foam: This pillow is adjustable to any sleep position providing a comfortable and sound sleep. With comfort, this pillow also alleviates certain sleep issues like neck pain, snoring, shoulder pain etc. • Contour Pillow: This pillow is the most recommended one to reduce neck pain and cervical pain. It comes up in contour shape that perfectly fits the neck shape and offers ample support for neck pain. • Bamboo Pillow: This pillow is totally hypoallergenic and Eco-friendly with outer shell bamboo-based cover. It is durable and soft that never goes flat and is adjustable. • Shredded Pillow: This pillow is a combination of memory foam and pressure relief points. It is extremely helpful for neck pain relief and for offering a comfy sleep. How To Find The Best Pillow For Neck Pain? • Check for perfect support: The pillow you select must support the curvature of the neck and upper part of the back in the sleep position of your choice. • Total comfort: While purchasing the pillow for your neck pain, ensure that it is totally comfortable for you and has required softness. • Material quality: The pillow material should be of high-quality to avoid any kind of allergy. Cheaper product tends to get flattened faster, while a better quality pillow is long-lasting and more supportive. • Hypoallergenic: Ensure that the pillow you purchase is totally hypoallergenic and environmentally friendly. • Know your sleeping need: Before buying the pillow that suits you, analyze your needs and sleeping positions. Choose the pillow that best matches your requirements. It is usually recommended to know the exact sleep issues and sleep needs before deciding to purchase a pillow because a wrong pillow can worsen the condition of your neck. Sleepsia, thus provides comprehensive information to better understand your needs and deliver the most suitable pillow for you. Sleepsia brand is completely reliable, durable with a hassle-free delivery process. To purchase the best product from Sleepsia, simply visit the Sleepsia official website Sleepsia.co and order the pillow that is best suited for you. ← Get an Eco-friendly Sleep with Bamboo Pillows!